We just returned from a week in the Smoky Mountains. That is one of my favorite places to visit. This is the view from the balcony of our cabin. It's a great place to just get away from it all and relax, and there are lots of things to do that are close. I visited several quilt shops. Here are some of the things that I found along the way. These fabric packs are from Lella Boutique for Moda. I love her fabrics. This time we ventured quite a distance to Mountain Creek Quilt Shop in Greenback, Tennessee. My friend, Michele had just been there and thought I should check it out. What a fun shop. I hope to return there sometime! I made this pillow from my Charming Hexagon Pillow Pattern. It's available from my Etsy shop or from Back Door Quilts. Here's another done in Little Red fabric by Moda. I added a flange to this pillow. I also made my grandson's these cloth books from panels that I bought at the Kokomo One Stop Shop Hop. That's the update for now. Time seems to be flying by, and I can't keep up. I do some sort of stitching each day and will be back soon to show you some of what I've been up to. I've been absent for a long while again. Part of the reason for my absence is that I've just been really busy. The other part is that I've been in a tizzy since I found out that I can no longer use Picasa to edit and email my photos to my blog. Putting photos in the old way takes way too long to put together a blog post. Does anyone have any suggestions of a photo editing program that I can use? I've published this Sunburst Dresden Table Topper pattern. This is a quilt as you go project, and it is available in my Etsy shop here. There is a partial tutorial that you can find on line, but there isn't really enough information there to make the table topper. Besides my knit mitered square blanket pattern, this Dresden plate table topper is my most pinned photo on Pinterest. The table topper above is the one I just did for the pattern cover. It is done mostly in Little Ruby fabric by Bonnie and Camille for Moda. The one that is pinned a lot is the Halloween table topper below. As you can see, I have one for every holiday and have made several for gifts. I'm still plugging away at my UFOs. This is the center of Holly and Mistletoe from the Blackbird Design book When the Cold Wind Blows. I think I have appliqued' all of the berries onto the center. The blocks have been done for several years awhile. The inner border is red flying geese. I somehow looked at the photo and made half square triangles, and all of them are too big. I'm beginning to see a "UFO Trend". Whenever I make a mistake (the over sized HSTs) or get to a part that I don't really like to do (making and appliqueing a LOT of circles), the whole thing goes back into the 2 gallon Ziploc bag. Some of my UFOs have been in and out of the baggie so many times that the zipper part doesn't work anymore. 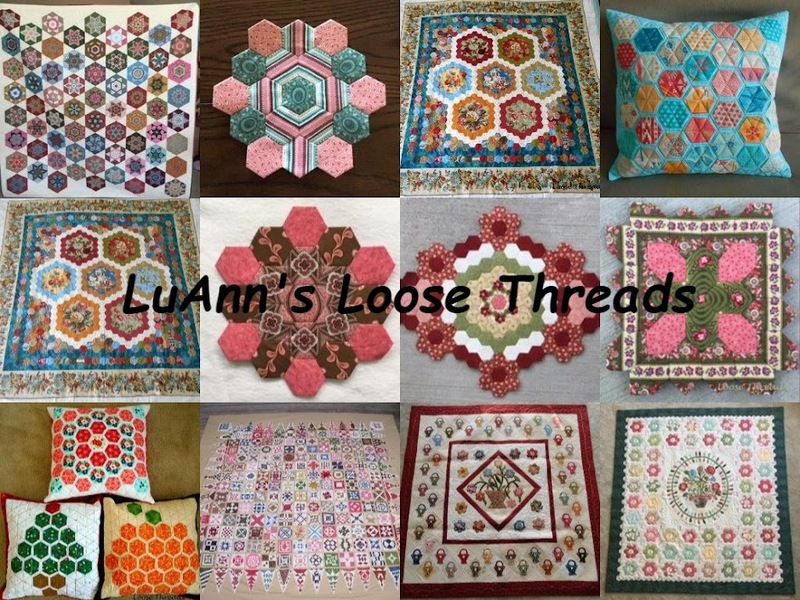 You can see my blocks and a photo of the quilt from the book in my blog post here. I've also finished the center part of my Brinton Hall quilt. The pattern is by Leigh Latimore and can be found in Quiltmania Magazine #107 and #108. You can see my process for making the center hexagons and individual photos of my blocks here and a photo of what the entire quilt would look like in my blog post here Right now I'm pretty happy with the way this looks with the border fabric, so I think this is a finished top. Those border corners are mitered. There are just some borders that look better mitered instead of squared off even though it is a little more work. Take a look at the photo below. This is how I always do my mitered borders. I measure the same as I would if I were going to do a regular border. After measuring, I pin and sew to the corners but leave a lot of extra fabric to do the miter. I pin the corner as shown, press, and either hand applique' the corner, or in this case I machine appliqued' the corners. I forgot to take a photo of the finished corner. My daughter really liked the pillow I made for the cover of my Charming Hexagon Pillow pattern which is the shop sample at Back Door Quilts, so I made this one for her.